WARNING: The FPA has seen evidence indicating that non-clients are being paid to leave fake positive reviews for FxPro. The FPA notified FxPro of this situation in December of 2013 and requested contact with the CEO to end FxPro's issues with fake reviews and to make certain that the issue would not repeat. Initially, there were replies from FxPro, but those ended in January 2014. Another message came in April 2014. The FPA replied, FxPro did not. The next message from FxPro wasn't sent until December 2015. FxPro was remided that the FPA wanted to hear from the CEO. The last message the FPA sent was on January 5th, 2016. FxPro's representative waited until October 2016 to reply. The company is now refusing to further cooperation unless the FPA signs a non-disclosure agreement and refuses to allow the FPA to have an email exchange with the CEO. The only reason the FPA can think of for requiring an NDA is that any report on the incident will incriminate someone in upper management who is still working for the company. There are 2 reasons we can think of for denying contact with the CEO. Either the CEO has not been made aware of the incident, or else the CEO does not care that the company has a history of using unethical methods to try to manipulate the reviews. The FPA recommends AGAINST dealing with FxPro until the CEO steps in to resolve this situation. August 2013-January 2014: Multiple highly suspicious positive reviews submitted. August 2013: The FPA would appreciate it if FXPro employees stop pretending to be clients when leaving reviews. Other websites of this company include http://www.fxpro.co.uk/, fxpro-vn.com. FxPro is a forex broker. FxPro offers the MetaTrader 4, cTrader forex trading top platforms. FxPro.com offers over 70 currency pairs for your personal investment and trading options. FxPro offers no-dealing-desk execution with no conflicts of interest between the company and its clients. Our acquisition of leading spot FX aggregator, Quotix, enables us to offer access to a deep pool of liquidity, as well as top-class order-matching and some of the most competitive spreads in the market. Manipulated prices on Coffee future...no evidence that the price was not manipulated. Company can't provide evidences that there was no price manipulation on coffee-h9 that I was trading with. Asked them several times, but they were saying that this was the international price, but without giving any evidence or external link, so that I could see that this was the actual closing price. I'm thinking the price was manipulated, so that they can close my opened trade at a big minus, as they did. I have been trading with FxPro for about 6 months until now I really found it amazing especially its customer service is unique. I am trading EurAud during recent Jan 2019 market crash. I find it odd when the daily high is more than 300 pips as compared to other brokers daily high. I am comparing with more than 5 brokers and the trend is consistent. FxPro high is more than 300 pips. Why this thing happened? The difference is so huge. They have good customer support. if you have a problem that can be handled, they solve it within short time. Money withdrawals flawless. The only problem is more than average spreads. Espicially AUD and NZD parities have about 60 tics spread in a normal time and of course it gets worse in news times and end/closing of the daily candles... Other than this, no problem. The best Broker of all the broker I used. Low spread. Customer service 24hrs. Fast withdrawal. So far the best broker for me. I have been using FXPro for a couple of months now. Only traded short term so never had trades open overnight. I recently started trading the 4H and Daily charts. Last night one of my trades was stopped out at 20 pips higher that the current price. When I querried this I got a reply that they widened the spread and that is why my trade was stopped out. They also stated it is not unusual for them to do this. The closing price was also 4 pips highr than my set Stop Loss, so if they widened the spread to 100 pips I would have lost 5x my risk I was willing to take. Trading with a broker that does these things make Money Management impossible. If you are serious about Risk management STAY AWAY from FXPro. I started my trading career with Fxpro when they are still north finance before they mergered to form Fxpro.com , I am 13 years with this broker and they are probably the best broker I have ever seen , I have opened account with difference brokers such as primeforex I was scammed $15000.00, I regretted my decision to move away from Fxpro during my early days of trading , about trading execution is a great experience with fxpro and their withdrawal methods is, perhaps, the best in the world, I used their infinite MarterCard in 2015 and it was a wonderful experience , i was able to shop with the card in any convenience shop and I withdrew my cash on any ATM around the world , withdrawal to the card take less than 2 minute . please, if you are a beginner in this markets watch and don't fall for these bad comments and beside there is No broker in the world that can offer 24-104 spread on crude oil or WIT this will probably ruin the account and the image of the broker will be tarnished, don't fall into the crash we experience when will start trading we rely on fake mentor and fraudulent people who link us to bad brokers, it has not been easy trading since 13 years till now , If you have any issue with them check your trading system and your risk appetite, no trader can survive with high leverage and much risk in this business. I strongly recommend Fxpro any time and any day! Great broker. Friendly customer service and faster responded. Withdrawal and deposite has a more way you can choose. left this company and not looking back, what a nightmare - worst spreads on WTI in the world, server slowdowns on news/ market opens could be up to 10s+ latency/ these are the real crooks be careful if you trade with them - not recommended for anyone that wants a true ECN broker and honest performance from the broker while trusting them with your money stay away my best advice/ Positive reviews are left by employees or their friends. Peace - don"t give them your business - very dishonest outfit. 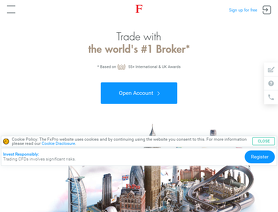 4.3 FxPro acts as principal to client transactions on a matched-principal basis, hedging such transactions with other companies of FxPro Group. FxPro Group companies act as market maker when executing Client trades and FxPro Group may profit from any Client losses. For more types of potential conflicts of interest, please refer to our ‘Conflicts of Interest Policy’.